One should neither feel bad for the past, nor waste time thinking of the future. koi aisa kar bahaana meri aas toot jaaye. मैं सितारे शुमार क्या करती! Main sitaare shumaar kya karti! चला जाऊँगा खुद को तनहा छोड़ कर "अल्वी"
मैं अपने आप को रातों में उठ कर देख लेता हूँ. Chala jaoonga khud ko tanha chhod kar "Alvi"
Main apne aap ko raaton mein uTh kar dekh leta hoon. Kis bulandi se gira hoon koi dekhta nahi..
Everyone can see where I lie, fallen. No one has time to see the height I fell from. Kya Dilli Kya Lahore is a script that needs careful treatment. It always walks that thin line of precarious peace. Full marks to the team for walking that thin line with aplomb. The story is predictable - 2 soldiers on the border post, both lonely, get friendly with each other. They take digs at each other, play chess, and cards. Loneliness , I have learnt, is a great glue. Every actor is so comfortable in their own space. Whether they have 2 minutes of appearance or 60, they all leave a mark. But the 2 lead actors truly bring the story alive on that stage. They make you laugh, cry and think. You see the broken fence right there, just like you see the broken heart when Umar Gul gives the steel tiffin to his friend and leaves. On the technical side, two things deserve special mention: The lights, and the stage. 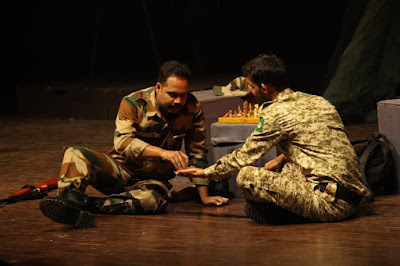 I was very impressed with the use of lighting for the scenes involving the 2 army officers, and when Umar Gul makes an entrance from the audience side. But even otherwise, the lighting was used to fantastic effect on that stage. The shadows were dramatic and stark. They made a statement of their own. The white screen was amazing. Madiha was a shadow behind that screen, as families usually are. And she darkened our world from right there. The live music was a great touch too. Please retain it. To the directors: Congratulations! Had I not seen it myself, I would not have believed that this play can be treated this way. You have a freshness that does not compromise on the excellence and yet brings something new to the delivery. Please try and retain that touch. If you get a chance to see this play by this group (Varchasv Theater group - I paid special attention to that), please do make the time. It will be worth it. I cannot write about Spring. In the season of spring. 1. "Zindagi lambi nahi, badi honi chahiye Babumoshai"
2. "Ek chutki Sindoor ki keemat tum kya jaano Ramesh Babu!" - God knows from where, but we have used and re used this dialogue God knows how many times! 3. "Inka naam hai, Pakeeza!" In the movie, Raj Kumar wants to marry Meena Kumari. They find a maulvi on the way and he asks him to conduct the marriage. The maulvi asks for the bride’s name and she is unable to answer. Then Raj Kumar fills in, “Inka naam hai, Pakeeza.” I use this dialogue often to indicate that sometimes, we can reveal the true nature of something just by changing what we call it. 4. "Shahabuddin! !” – the way the mausi screams that name at the end is enough said for that person. 5. "Pushpa, I hate tears!" - Any Hindi movie buff worth their salt will know this one. 6. "Ja Simran, jee le apni zindagi... "
From DDLJ, that Ja Simran, Jee le apni zindagi... enough said. Since Hitchie has covered all Sholay dialogues, I am not repeating them here. Consider them all repeated. I know, I know, this list is getting rather hachneyed and all that.. but hey, the best is the best for a reason! 8. Main aaj bhi gire hue paise nahi uthata..
Before you shrug and give up, let me just give u the alternative uses of the dialog: Main aaj bhi microwave kiya hua khana nahi khata; main aaj bhi unironed uniform nahi pehnata.. and so on. The story is about this lady who is lovely, but doesn't know English. She goes to her sister in NY and secretly joins a class to learn English. Someone in the class falls for her. Her niece asks her if she will take it further. This is her response. An affluent couple tries to get EVS quota for their child's school admission and takes up residence in a low income society to qualify under EVS. You have to see the 2 sequences to understand why this is the best dialogue from the film. Love should be given away freely, without withholding. कोई पूछे के मुद्आ क्या है।"
So you must lie in it. " जिसका मन किसी प्राणी को संकट में देख कर द्रवित हो जाता है (पिघल जाता है), उसे ज्ञान या मोक्ष पाने के लिए जटा बढ़ाने या भस्म लगाने की क्या ज़रुरत है? A person who is moved by the plight of another living being, needs no penance or ritual to attain enlightenment or moksha. मूंछें मुझे चुभाते हैं !! These must be used/consumed only with thorough knowledge, else they can cause harm.